Native To This Stream: Brief Writings About Fly-Fishing & the Great Outdoors is a collection of eleven previously published short stories, essays, and poems by Paul Weidknecht. It's a brief read, approximately 80 pages which only took me a little over a half hour to consume it cover to cover. I have to say, I was pleasantly surprised. Many of the stories (literally) hit home; the author is from New Jersey, and his writing immediately took me back to my Mid-Atlantic fly fishing roots. Two entries that were particularly enjoyable were The Native and Limestoned, both short stories. One about the "birth" of a fisherman, the other perhaps about the "re-birth." A little bit of humor, a little bit of raw emotion, and the backdrop of fly fishing, it's quite a feat to cram such robust tales within a few short pages. I'm not going to lie, the handful of pages of poetry weren't my speed. I wouldn't say they detracted from the otherwise very satisfying experience, they merely served as bumpers in between stories. I've just never really been "into" poetry, that's my shortcoming, not the book's. They could be Robert Frost quality, they'd still go over my head. 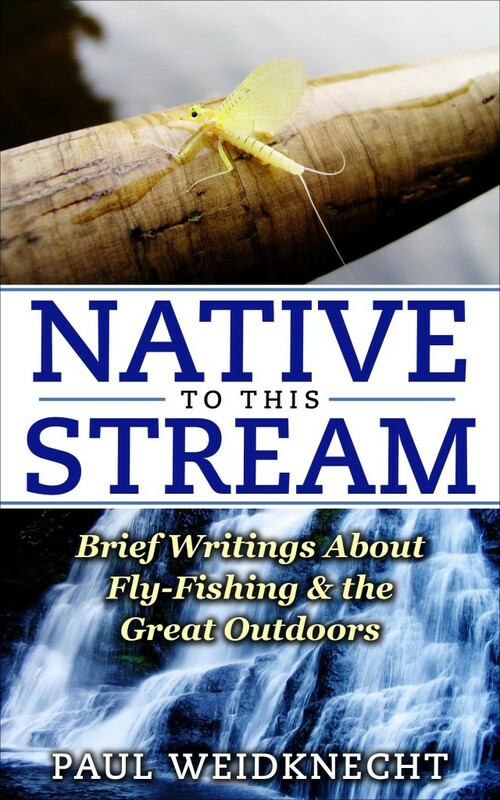 Perhaps I enjoyed Native To This Stream so much because it reminded me of my favorite fly fishing book, Upriver & Downstream, also a collection of short stories. Small bites, easy to consume, sort of like a collection of blog posts. If you're looking for some light reading, or possibly an inexpensive gift to give to a fellow fly fisherman, I couldn't recommend it more. The book featured in this product review was provided to me at no cost, but carries a suggested retail price of $7.99 (paperback) or $2.99 (Kindle). That said, anyone who has read a review here before knows that free product does not equal a positive review. It just so happens that I've been looking for a new book to read. It just so happens that I've also become enamored with reading books around that particular area thanks to Ralph Long and his great writing. Thanks for the heads up Mike. I was going to write this like a poem but I figured it would go over your head. On an off chance that Nook might have it, I zipped out and there it was. I'll give it a shot.